I love almond pastries! There’s a bakery in Provo that makes the best almond bear claws which I get infrequently because they are always sold out by the time I get there. So I decided to try making my own! Instead of individual pastries, I made one big pastry that could serve four people. It is perfect for a brunch get-together. The triple almond comes from the almond filling, almond extract, and sliced almonds. Basically, it’s almond overdrive! So keeping with the “triple” theme, I thought of the jazz song “Three Little Words” sung by a very young Ella Fitzgerald. I love this version because it’s Ella at an early stage in her career, which adds to the pure sweetness of the lyrics. Defrost the puff pastry. Roll dough on a parchment paper lined cookie sheet (not a jelly roll pan or air bake cookie sheet) to be an 18"x6" rectangle. Combine almond filling, nutmeg, almond extract, and vanilla in a small bowl. Spread over half of the puff pastry width-wise, leaving a 1/2" edge. 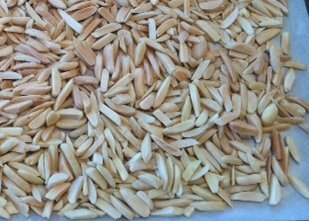 Sprinkle toasted almonds over the filling. Fold over the puff pastry to cover the filling. Roll the bottom pastry over the top pastry edge then twist to tuck the bottom into the top. Press down with fork tines around three sides of the edges that are rolled in order to seal. Make slashes through the top layer of pastry to allow steam to escape. Bake for 12 minutes. Then reduce the oven heat to 375 degrees. Bake for an additional 20 minutes. Remove from oven and let cool for at least 10 minutes. 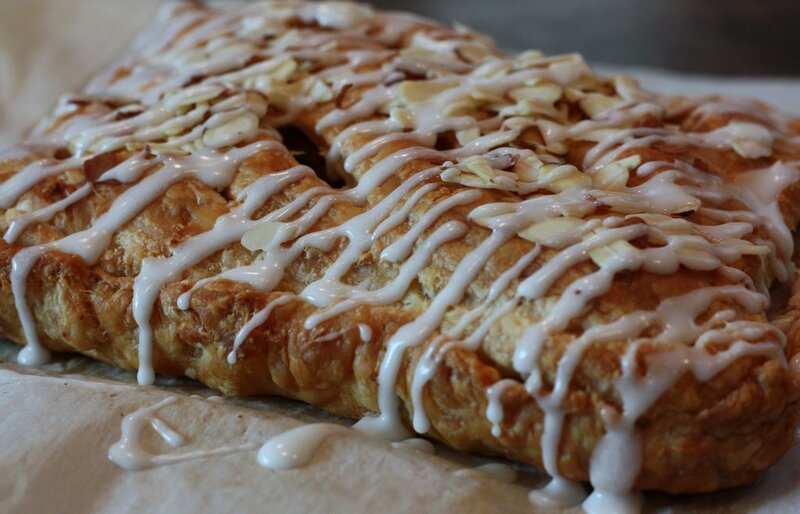 Spread raw almonds over the pastry. Combine powdered sugar, almond extract, and half-and-half in a bowl. Drizzle over the pastry to make the raw almonds stick to the pastry top. Serve plain as a breakfast pastry or with ice cream for dessert.